For much of the last two decades, Thaksin Shinawatra has haunted Thailand’s political system. 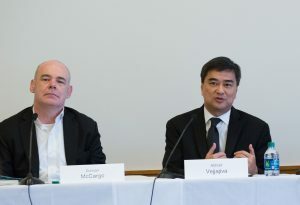 In addition to Abhisit, the panel discussion also included Duncan McCargo, a professor of political science at the University of Leeds and co-author of “The Thaksinization of Thailand” (Nordic Institute of Asian Studies, 2004), and moderator Alan Wirzbicki, a senior editorial writer at the Boston Globe. Abhisit, who said he spent much of the last two decades in politics “fighting populist leaders, from Thaksin to his successors,” detailed three factors that contributed to Thaksin’s rise. Another factor was Thailand’s “long history of rather messy and corrupt coalition governments,” which led many to develop “a very cynical view” of politics. It also led to the adoption of a new, more progressive constitution in 1997 that sought to stabilize the political system by granting the prime minister far-reaching executive authorities. 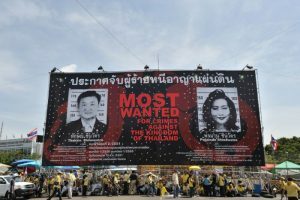 The third factor was Thaksin himself, the first politician to introduce “modern campaigning methods” into Thai politics, who managed to position himself as an outsider despite having been in politics for a number of years and filling his party with political veterans. 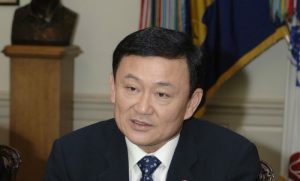 Thaksin offered a range of welfare policies that appealed to Thailand’s disenfranchised rural populations. Thaksin, said McCargo, was initially seen as the leader that was going to break “the cycle of coups and protests and new constitutions,” but failed to do that. Nevertheless, he managed to remain an “incredibly dominant figure,” winning two elections (2001 and 2005), in addition to two elections won by his successors (2007 and 2011), and two elections, in 2006 and 2014, that were boycotted by the Democrats and later annulled by the courts. Much like other populist plutocrats, Thaksin also used his office to enrich himself. “People felt he’s corrupt, but they also had this impression that all politicians are corrupt anyway, so it was better to have somebody who is corrupt but did something that benefited them, rather than being corrupt and not doing anything for them—again, very much like Berlusconi,” said Abhisit. 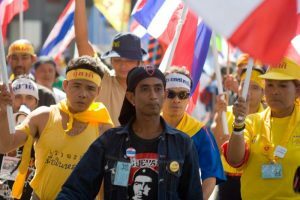 What can U.S. Democrats learn from the failure of Thailand’s opposition? When it comes to defeating populist plutocrats, Thailand offers a cautionary tale. 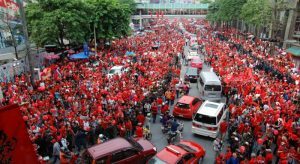 While the opposition (led by Abhisit and the Democrats) were able to briefly regain power in 2008, they failed to hold on to it and suffered a crushing defeat to Thaksin’s Pheu Thai Party (headed by Yingluck) at the 2011 elections. Despite his convictions, the removal of him and his party from political life, and the seizing of his assets, if elections were held today “there’s a very high chance that some pro-Thaksin figure would win again,” according to McCargo. Thailand’s opposition, said McCargo, is largely responsible for the hostility they encountered: They boycotted elections they didn’t expect to win and then encouraged the courts to annul their results; they benefited from the suppression of Thaksin and his political allies; main figures within the opposition backed the mass protests that instigated the military coup. “It’s difficult for the opposition party to say ‘actually we were really on your side, we weren’t using improper tactics,” he said.